Jonathan's Birding Blog: February Birding at Rainham Marshes RSPB - a Brent Goose, a crazy Falcon and several cool Gulls. PS not to forget the Fulmar! February Birding at Rainham Marshes RSPB - a Brent Goose, a crazy Falcon and several cool Gulls. PS not to forget the Fulmar! Typical late winter birding during February, continuing winter birds and a few nice surprises kept us entertained. The seemingly never ending conveyor belt of Atlantic fronts and strong SW winds were the order of the month apart from the weekends of 13/14 and 27/28 when at last an easterly component reminded us of winters past. A Brent Goose pinged it's way between the reserve and the river was a highlight on the 6th. The following weekend saw the first Gull workshop of the winter. Despite the morning rain and bitingly cold wind from the east it was well attended and received generous donations. Helped DDL at the event who gave a fantastic commentary of the gulls on offer, of which the 5 typical gull species put on a show throughout the 2.5hrs. A 2nd winter Yellow-legged Gull added to the list, but it was not so obliging as it headed upriver at distance. 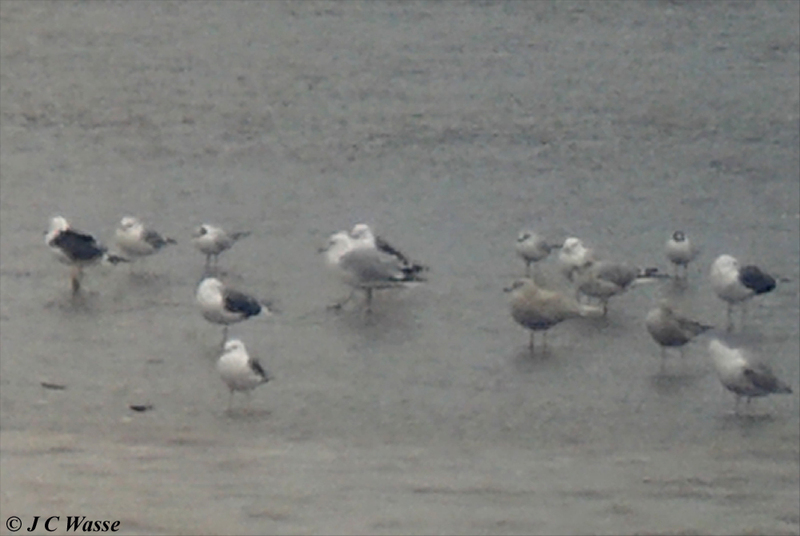 Next day there were at least 7 Yellow-legged Gulls in Aveley Bay - 2nd winters and older. Back to the 13th and given the conditions I was hoping for an unusual seabird to come by. Around 15:30 news broke of a Fulmar drifting upriver (FS) and this had us scrambling out of the centre onto the balcony. HTV soon picked it up drifting into Aveley Bay. A cracking record and they don't half look unusual inland. The shocking white head and underparts with a downward angled head profile gave it a distinctive look. 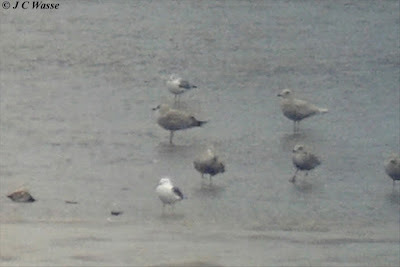 Noted that the gulls were curious of this visitor and even mobbed it on occasion, record shot below. The afternoon of the 13th also saw the finding of a Brambling at the feeders, well twitched for the Rainham Marshes 2016 Bird race, this species being generally scarce in the UK this winter. Also a crazy Falcon attacking anything that moved on the Target Pools a few moments earlier. This big beast, characterised by dark brown upperparts, pale head, heavily barred underwing and pale rump and tail was thought to be a hybrid - Gyr x Saker? At one stage it had a swerve at one of the Marsh Harriers! Marsh Harriers showed brilliantly with 5 present on 21st comprising 2 ad/subadult males, 1 imm male and 2 imm females. An adult female present on 28th added to the mix. The wintering Rock and Water Pipits remained, the former getting brighter with the plumage change betraying their Scandinavian origins. One Water Pipit present briefly near Coldharbour Point (27th) seen in flight looked to be well into the plumage change. I saw a Dartford Warbler briefly on 28th in the usual spot, sadly it was just a brief look as it dived back into cover. Wintering ducks showed throughout with many becoming brighter and brighter as their thoughts turned to Spring with Pintail looking graceful as ever. Waders included up to 400 Dunlin roosting with Lapwing and Golden Plover (200) on the reserve at high tide. 13 Black-tailed Godwits favoured Aveley Bay (27/28) and Oystercatchers returned during the month. 2 Avocets could have been the stars of the 27th but for me gulls stole the show- as always! Arrived at the centre just after 10:00 on Saturday 27th. Made a quick scan of the gulls on the mud on the Kent side of the river opposite the reserve hoping for a 'Caspo', and picked up on a pale immature that looked smaller than immature Herring Gulls that were alongside it. It wasn't side-on so couldn't clinch its ID at that moment, but it had the feel of a 1st w Iceland Gull - benign head and small billed. Alerted others of the possibility and after a couple of minutes (felt like ages) it swung itself around revealing paler primaries, noticeable projection even at such a range. Got the word out and the bird was well twitched. A coupe of record shots below. 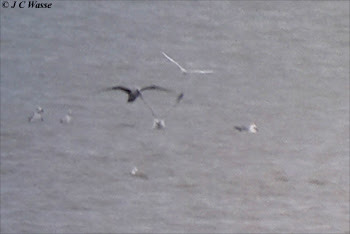 It stayed in the area for about 3.5 hrs before appearing to fly upriver around about 13:45. A 1st w Caspian Gull showed late morning near to the Iceland Gull (AL) plus the gang got onto a stonking adult summer Mediterranean Gull that did a flyby early afternoon (PS). With a couple of Yellow-legged Gulls seen we had a 9 gull species day.